“So, what do you do?” The businessman asked me at a networking meeting. “I’m a copywriter,” I responded. 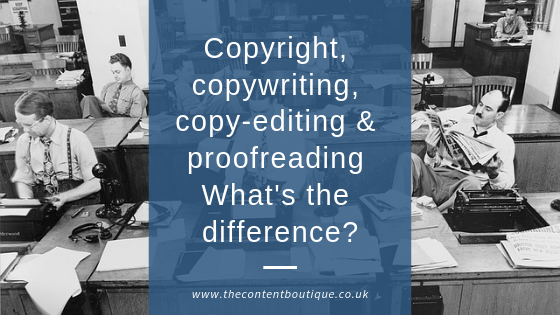 By the same token, people often confuse the terms copywriting, copy-editing and proofreading. You see, each discipline is carried out independently from one another. Indeed, you can employ specialists to carry out each task. But when copywriting, copy-editing and proofreading come together, magic happens. A copywriter is a sales and marketing writer who writes persuasive words that drive action. Traditionally, copywriters provided the words for advertisements that appeared in printed newspapers and magazines — also, direct mail and company brochures. Today, in addition to print advertising, you see and hear copywriters’ words on websites and digital content such as blogs, videos, animations, emails and more. Copywriters start with a problem your customer is trying to solve. Then they flesh out the benefits of solving the problems with your products and services. At the same time, they overcome objections. Finally, they lead the reader to take your desired action. You could describe a copywriter as a salesperson in print and digital media. A professional copy-editor works on anything from web pages through to novels and academic dissertations. Its objective is to take your first draft and knock it into shape ready for publication. In the first instance, a copy-editor fixes problems with wordiness and jargon. Then, it assesses your copy’s structure to make sure it’s easy for a reader to follow your words. After that, a copy-editor checks to make sure the style and tone of your copy are suitable for the medium in which you plan to publish your material. For example, the style and tone of copy that appears in a brochure are very different from that of text that appears on a website. Beyond that, your copy-editor will probe the accuracy of your facts. At the same time, it will flag anomalies such as misspelt names and incomplete references. Elsewhere, it will signal inconsistencies such as formatting of headings, use of italics, or units and measurement. Although responsibility lies with the writer, some copy-editors also flag up potential legal issues such as breach of copyright and plagiarism. Traditionally, after a draft is edited and given to a designer to layout, a printer provides a ‘proof’ for a customer to check before committing to an expensive print run. Today, you can upload copy immediately to digital platforms. But before you do so, it’s vital you get your copy proofread. Here’s the thing, not only are typos and grammatical errors embarrassing, but they also put your credibility and trustworthiness at stake. A proofreader scrutinises your final version for grammar and formatting errors. It reads your copy forwards and backwards to pick up typos, rogue spaces and line breaks, missing captions, page numbers and more. Before publication, you can expect any material, be it a novel, academic theses or piece of marketing content to go through three distinct processes. When it comes to marketing copy or words that sell, the combination of copywriting, copy-editing and proofreading will ensure your readers enjoy a frictionless reading experience, and content written in your voice and with your authority. More importantly, your marketing copy will be structured to guide the reader into taking action. The good news is that this doesn’t have to be you. The Content Boutique provides copywriting and copy-editing services. Because I work so closely with your copy, I’m aware I can become blind to typographic errors. So I prefer to outsource proofreading to a trusted expert. If you’d like help with copywriting and copy-editing services, drop me a line, and we’ll set up a time to chat.